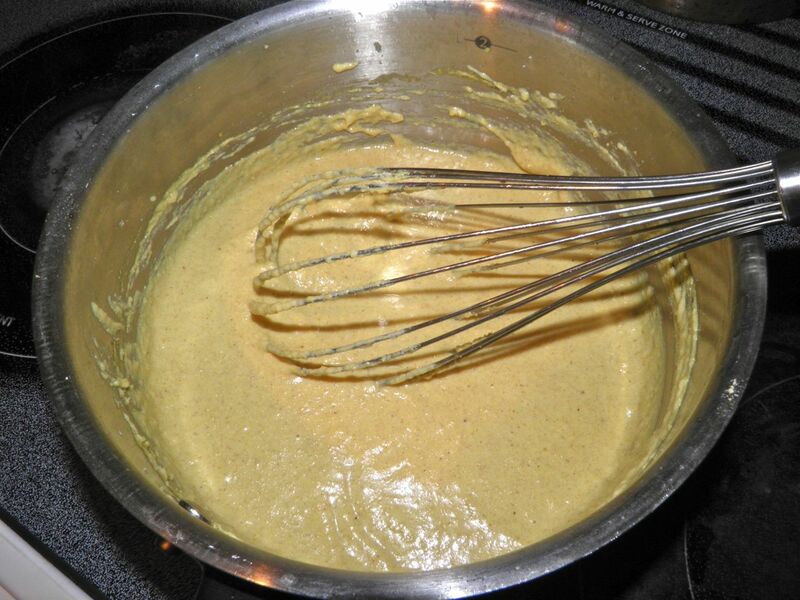 For my original Dijon Mustard recipe look here. Delicious homemade Dijon mustard (no.2). 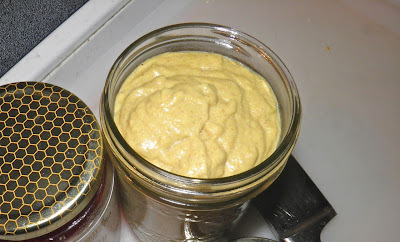 Homemade mustard is amazingly easy to make, and it is a wonderful gift to give and receive. Last Christmas I gave away small jars of several different kinds and received compliments well after the Christmas season. People love homemade mustard. I should know. I have had more hits on this blog due to my Dijon recipe than any other post by far. It's only rival (by half) is my Maritime Brown Bread recipe (here). I guess that many of us share two qualities: we love our Dijon, and we hate to pay the price it is in stores. I suppose that is why many of us look to blogs and other online sources to make our own things. I love Dijon mustard. In fact I hardly ever use any other kind of mustard, in a "daily" capacity. There’s many other wonderful ones but Dijon is my standby. I have posted Dijon “1” as well as an amazing cognac mustard, oktoberfest, porter beer and yellow hot dog. Click the names to see the recipes. But I always wanted to tinker with my Dijon recipe. The reason was not so much that my first recipe wasn’t “bang on” (it was…). I wanted to see the difference that varying method and ingredients slightly would make. I know from my own mustard making that small modifications yield big changes. I guess I was looking for variation within the family, kind of like different commercial brands of Dijon have different taste. Humans have used mustard for a long time. The Greeks used it more as medicine because of its super antibacterial properties. Hippocrates made poultices and mustard plasters (thick pastes) to treat things as varied as scorpion stings and toothaches. It took the early Romans before it was used as a food. We’ve come a long way, baby – to paraphrase the Virginia Slims cigarette slogan of the late 1960s. Homemade (and commercial) mustards now have so may wonderful ingredients and flavours it boggles the mind. I do have to say, my meddling turned out very well. My slight changes (more onion flavour, a little more honey and a shot of cayenne) really made a wonderful difference. This is not a honey Dijon. Not by a long stretch. That will be coming in the future. There is one homemade mustard that has eluded me. It’s called Pommery. Mustard Pommery has been made in only one location in France – Meaux – since the early 1600s by the Pommery family. It has graced the tables of presidents and kings. This mustard is at the top of the list of anyone interested in fine food and fine ingredients. If anyone has cobbled together a reasonable facsimile please let me know. I would be forever in your debt. That’s Pommery mustard. I would really appreciate it. But back to Dijon No. 2… Make this mustard. It won’t be your last time. Step 4: Whisk until thickened over heat. 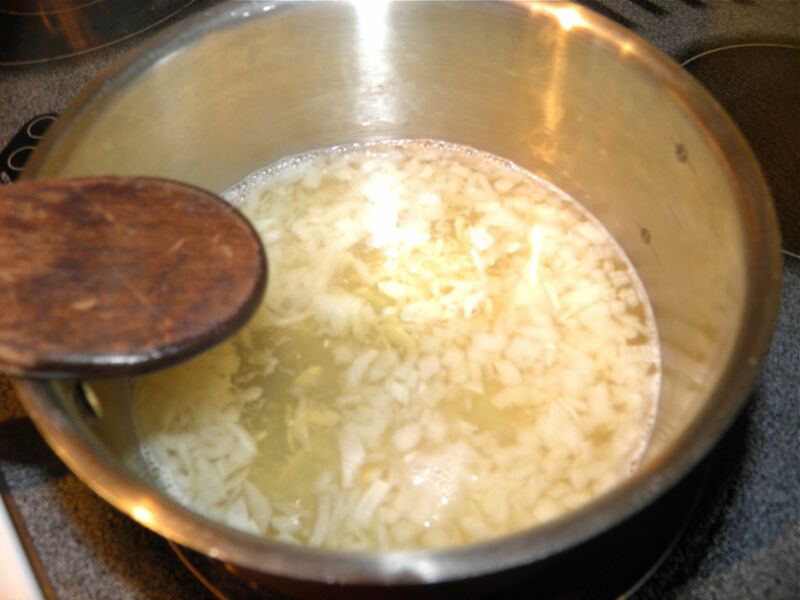 In a small saucepan, heat garlic, wine and onion, bringing to a boil. Then simmer for 5 minutes and remove from heat. 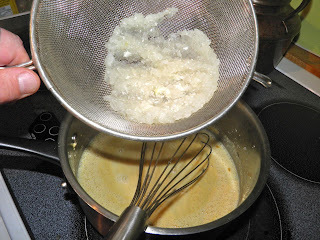 Purée the mixture with a stick blender, food processor or blender. It doesn’t have to be smooth. Set aside in a glass or ceramic bowl for 10 minutes. 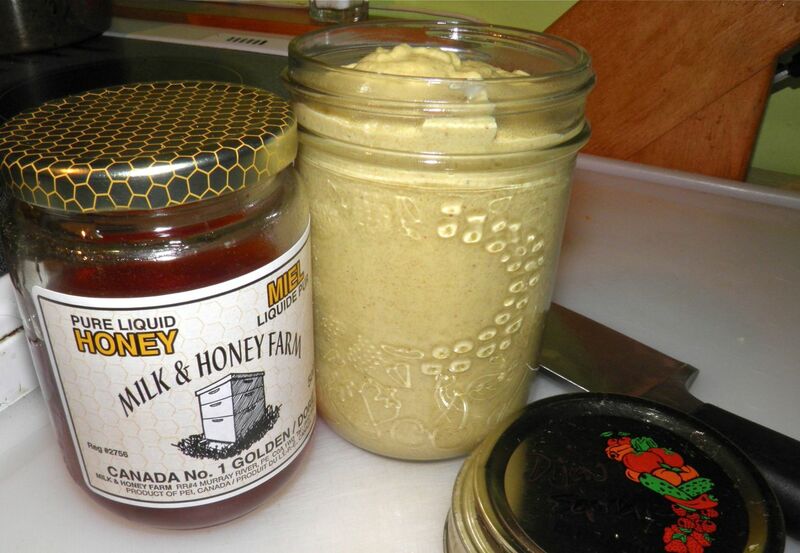 Step 5: Add the honey, honey. Add the dry mustard to the saucepan. Add the salt and cayenne and mix well. 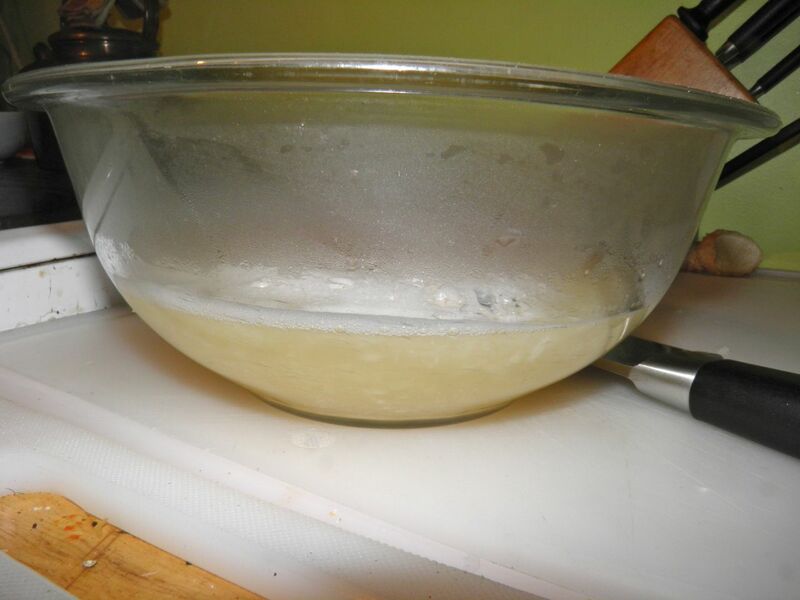 Add the sunflower oil and then strain the wine mixture over top to remove the remaining solids. 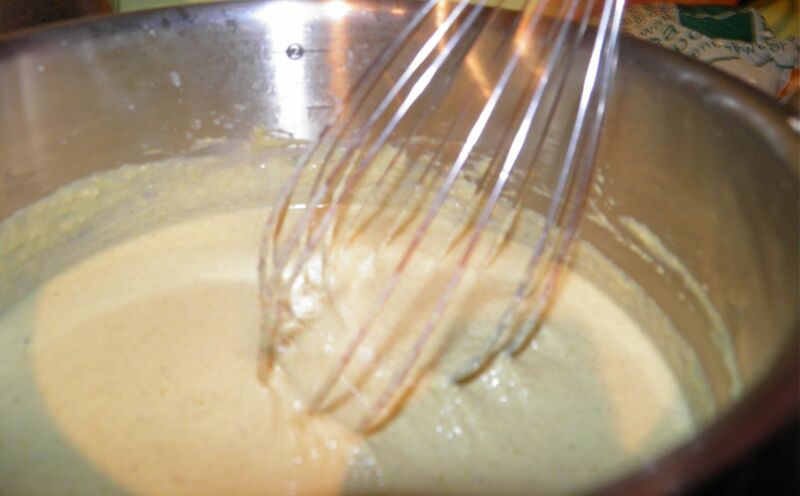 Whisk until smooth, making sure there are no lumps. Place over medium heat and cook until the mixture thickens, about 3 minutes. Add the honey and cook for a further 3 minutes. The mixture will thicken more when refrigerated. Add a little turmeric if you wish. I compared this mustard to a jar of purchased Dijon and that addition would have brought the colour to exactly the same creamy yellow hue. Remove from heat and place in a 500 ml, or smaller jars if gifting. It takes a couple days for the mustard flavours to meld completely, but it can be used as soon as it cools if you wish. Step 6: bottle, refrigerate and you're done. Easy, right? ?